Internationally-acclaimed French baritone Stephane Degout graduated from the Conservatoire National Supérieur de Musique de Lyon and then became a member of the Atelier Lyrique de l’Opéra de Lyon. Degout gained international attention when he made a triumphant debut as Papageno at the Festival d’Aix-en-Provence in 1999. Since then, he has appeared at the Opera de Paris (La Bohème, Die Zauberflöte, Ariadne auf Naxos, Così fan tutte, Iphigénie en Tauride, Le nozze di Figaro, Tannhaüser, Hippolyte et Aricie and Pelléas et Mélisande), the Berlin Staatsoper (Orfeo), the Théâtre Royal de la Monnaie (Orfeo, Pelléas et Mélisande, Così fan tutte, La Bohème, Die Zauberflöte, Le nozze di Figaro and Iphigénie en Tauride), the Theater an der Wien (Così fan tutte, Orfeo, Pelléas et Mélisande and Hamlet), the Royal Opera House in London (La Cenerentola, Roméo et Juliette and Così fan tutte), the Lyric Opera of Chicago (Die Zauberflöte) and the Metropolitan Opera (Roméo et Juliette, Die Zauberflöte, Pelléas et Mélisande and Le Comte Ory), Tearo all Scala (Le Comte Ory), and the Bayerische Staatsoper (La Nozze di Figaro). He has also performed at the Salzburg, Glyndebourne, Holland, Aix en Provence and Chorégies d’Oranges festivals. 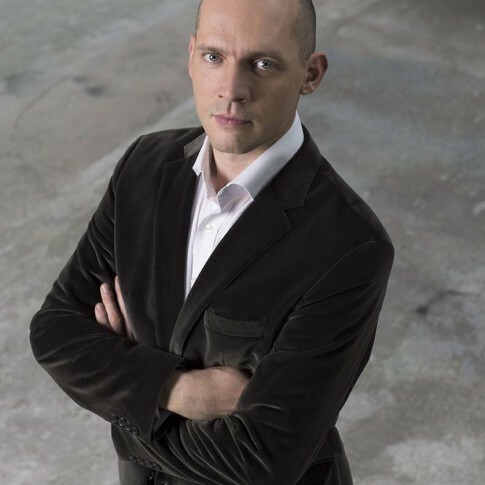 Equally renowned as a recitalist and concert singer, Stéphane Degout regularly performs in recitals in Paris, Montpellier, Brussels, London, Rome, Berlin, Amsterdam and New York. He recently made his début at the Chicago Symphony Orchestra under Riccardo Muti. Mr. Degout has recorded Werther and Così fan tutte (in the production of Patrice Chéreau for the Aix Festival), Pelléas et Mélisande along with Le Comte Ory (Metropolitan Opera) in DVD format for Virgin Classics. He has recorded Brahms’ Deutsches Requiem (piano version) and the Fauré Requiem for Naïve as well as La Bohème for Deutsche Grammophon. ‘Mélodies’, dedicated to the French repertoire, is the first CD he has recorded in the context of a new collaboration with Naïve Records. In the season 2014/2015, he returns to the Chicago Symphony Orchestra, the Opera de Paris (Pelléas), and the Theater an der Wien. Stéphane Degout was appointed ‘Chevalier de l’Ordre des Arts et des Lettres’ in September 2012; a prestigious award which recognises ‘significant contribution to the enrichment of French cultural inheritance’. He was also awarded the prize ‘Lyrical Artist of the Year’ at the Victoires de la Musique Classique 2012. In addition, he was named Beste männliche Hauptrolle in June 2013 at the Musictheaterpreises for his title-role in Hamlet.